© 2018 Mark Maio "Storm Moving In, Elgol, Isle of Skye, Scotland"
Along with the unique landscape of this volcanic island, weather plays an integral part of any photography workshop on the Isle of Skye. Weather systems moving across the Atlantic have nothing to slow them down until they hit the outer and inner Hebridean Islands, that form a barrier, protecting mainland Scotland. These constant changing weather systems, with clouds so low at times you can almost reach up and touch them, add drama to a landscape that doesn't need their help. This year's workshop began just as Hurricane Florence came ashore in North Carolina. Since the Gulf Stream moderates and affects the weather of the Hebrides, it seemed like Florence was going to become a part of the workshop. We started the week with overcast skies and rain. My fear, like anyone either attending or conducting a landscape photography workshop, was that this was a precursor for the entire week. Watching the weather and the tide tables, we headed to the most southwesterly village on the island, Elgol and the fantastic vistas of the Cullin Hills across Loch Scavaig. I planned on arriving at low tide but the fifteen-mile single track drive from the village of Broadford, traversing along landscape that begged us to stop at every other turn, took much longer than expected. Once there, we began walking along the miles of rock covered shoreline as the tide began coming in. At the same time, the wind began increasing. Little did we know that it would quickly reach 100 mph. I moved out along the shore, watching a massive rock being assaulted by the wind and water and picked a path that I thought would keep me from slipping or getting wet. The plan on not slipping worked out but I wasn't as lucky with the waves. Moving closer to the rock and looking at my composition with each step forward, I lost track of the frequency of the waves and was drenched in short order. 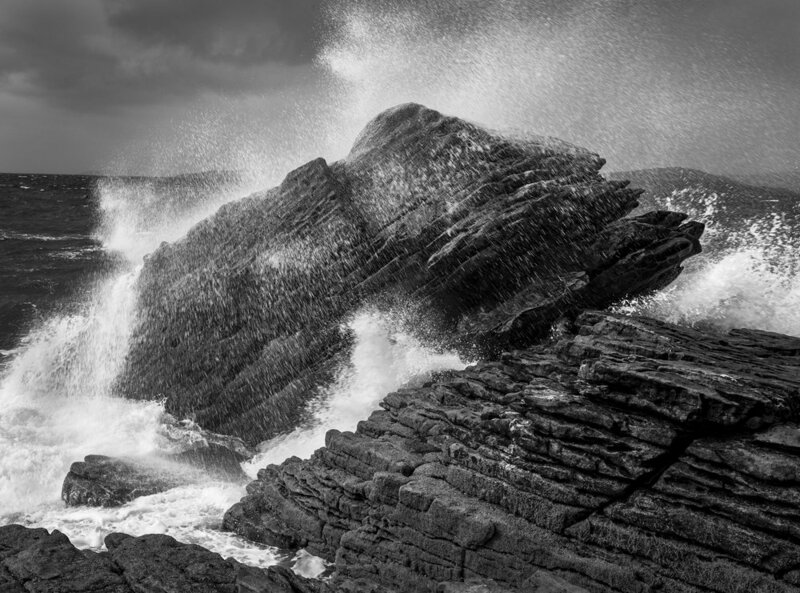 Fortunately, I had my camera protected and after about forty-five minutes of playing hide-and-seek with the waves, I was able to make "Storm Moving In, Elgol, Isle of Skye, Scotland". © 2018 Mark Maio "Elgol Beach, Isle of Skye, Scotland"
Completely soaked, I continued along the rocky coastline, looking for a large round rock I had discovered a few years earlier at low tide. I found it just as the light disappeared again. I was in that zone between the storm and it becoming clear. Waiting for the light, I walked around it following a lesson I had been taught many years ago by photographer Ted Orland, to let the subject tell you how to photograph it. After an hour of maneuvering myself between a series of ledges and rock formations, I finally "heard" what the rock was telling me and settled in to wait for the light. A half hour later the clouds opened again, providing me with a couple of opportunities to make images - timing my exposures to coincide with the series of waves coming ashore. The effort produced, "Elgol Beach, Isle of Skye, Scotland". Mid-week brought us less wind, breaks in the clouds and with it, dramatic light. Consulting the tide tables again, we headed to Carbost and three abandoned boats at the end of the loch. With the tide moving out, the boats became more exposed. Like most of the week, there never was a time when the clouds opened up and we had an extended period of direct light. We watched as large patches of light moved in front of, behind and to the sides of the boats, but never illuminating them directly. We spent over an hour watching the sky and trying to predict when some open area in the clouds would allow some light on the boats. Finally, after being teased more than once with the glimmer of light hitting the boat, the sky rewarded our patience with almost a full minute of light. Just enough time to make the seven exposures comprising the panorama above. © 2018 Mark Maio "Kilmur Old Churchyard, Duirinish, Isle of Skye, Scotland"
The end of the week brought spectacular Skye weather. Moving clouds framed by sunny blue skies with an occasional brief rain shower and if we were lucky, a rainbow. We stopped at the Kilmur Old Churchyard and although I have been photographing it for ten years, it always reveals something new to me. The ruins of the church are surrounded by a graveyard dating back a few centuries. I typically concentrate on the old tombstones but this time the light led me to the church itself. Walking in I was drawn to the bright light illuminating the far wall and the dark shadows encroaching from both sides, giving it an unusual 3D effect. With my back up against the far wall, I wasn't able to include the entire image I had visualized. Using my 35mm lens, I made a series of four vertical images to create a panorama that essentially replicated a wider angle lens. © 2018 Mark Maio "Double Rainbow, Waterish Peninsula, Isle of Skye, Scotland"
The final day of the workshop brought more great weather and light. During the day we counted eight rainbows as we moved from one end of the island to the other. We finished photographing at Neist Point, the most westerly part of the island. Driving back, we saw one end of a beautiful double rainbow and stopped to photograph. Continuing on, we rounded a corner and were treated to one of the most beautiful rainbows I have ever seen. Stopping to photograph guaranteed we would be late for our dinner reservation. © Mark Maio "Atomic Test Site, Isle of Skye, Scotland"
With only a few days after the workshop to do any photography on my own, my wife and I took advantage of the much improved weather to do our own exploring. We live near the furthest northern end of the island and routinely, on the last late afternoon before we go home, we do a drive around the "north end". Approaching the true north of the island and looking towards Iceland 625 miles away, a storm in the shape of a mushroom cloud moved across the water. I found it a fitting last image to make after a week dominated by such severe weather on an island named after, not its magnificent landscape, but for the sky which reigns over it. My next Isle of Skye photography retreat will be May 26 - June 1, 2019. I have decided to keep the number of attendees to a maximum of five. Please contact me if you are interested in joining me.